Rinse the cherries and remove the stalks, but don’t stone them. Melt the butter and sugar in a large frying pan over a moderate heat, and add a squeeze of lemon juice to stop the sugar crystallising too much. The mixture will look rather crumbly and fudgy at this stage, but don’t worry, it will sort itself out later. Add the cherries to the pan, turn up the heat, and cook for about 5 minutes, moving the cherries around the pan occasionally. 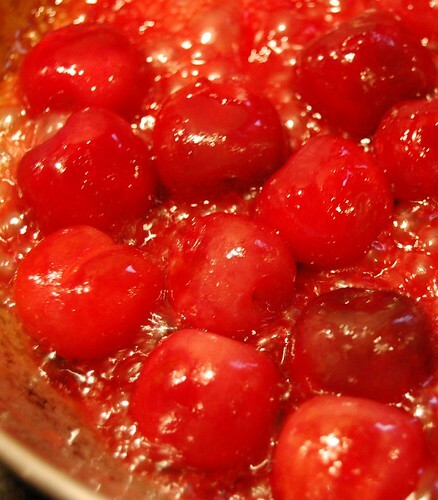 The cherries will release some of their juices, turning the butter mixture pink. When the juices have just started to caramelise, quickly add the guignolet, being careful not to be splattered by boiling sugar. Let the mixture boil up for a moment — it should take on a syrupy consistency — and then remove from the heat. Pour into a glass bowl. This can be eaten hot or at room temperature, in either case with a scoop of ice cream on each serving.